When I first visit a Stack Exchange site using a different computer, browser, Incognito mode, etc. the cookie footer appears at the bottom (as it should). Your use of Stack Overflow's Products and Services, including the Stack Overflow Network, is subject to these policies and terms. Is "Stack Overflow Network" or "Stack Exchange Network" correct? 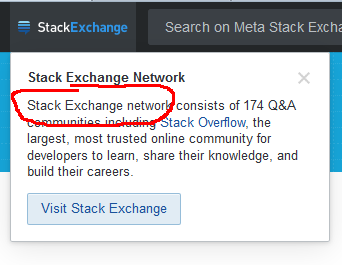 It's definitely the "Stack Exchange Network". What can sometimes get confusing is that the brand name for the entity that runs said network is "Stack Overflow", not "Stack Exchange". So, sometimes you will see someone say "Stack Overflow" when talking about the company and not the literal site stackoverflow.com. It's possible that's where this error came from. Someone started the copy with "Stack Overflow" and then was in the process of changing it to "Stack Exchange Network" to be less ambiguous, but only added "Network" without changing "Overflow" to "Exchange". There's also the possibility that for GDPR reasons (which is why this banner exists), this is by design... so let me get some more info and get back. Not the answer you're looking for? Browse other questions tagged support stack-exchange-button . Has “the SE Network” been changed to “the SO Network”? What role does Fog Creek Software have in the ownership of the Stack Exchange Network?